A brilliantly coordinated spectacle, their performances combine leader J. Willgoose's guitars, banjos, electronics and old public information samples with drummer Wrigglesworth's groundwork and visual director Mr. B's projected film clips. They've shuffled things around since May's appearance at The Cluny too, with a pair of new songs adding to those from the album and last year's War Room EP. Bizarrely, both took their material from Dutch ice-skating films — a quirk which, in Willgoose's automated words "seemed like the next logical step" — and indeed there were no arguments regarding their quality. "Elfstedentocht Part 1" was a guttural, down-tuned rocker, propelled by looping, muscular riffs, while the comparatively slow-burning "Part 2" eventually settled into one of their most infectious and danceable grooves yet. Language barrier aside, the pair fitted seamlessly among more established favourites, which were reeled out to predictably ecstatic response. The pace-setting "Theme from PSB," the ominous "If War Should Come," their signature tune "Spitfire;" almost every number was prominent its own right, and crucially their impact on stage continues to transcend their considerable recorded achievements. 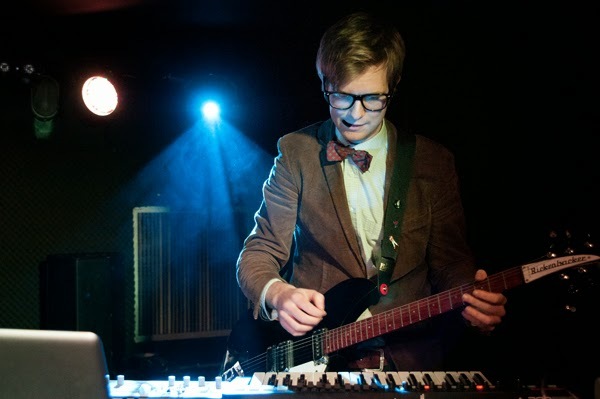 With so much of 2013 spent touring, you sense Public Service Broadcasting's next UK jaunt may be a while in coming, but whenever (or wherever) it is, you can bet it'll be worth catching.